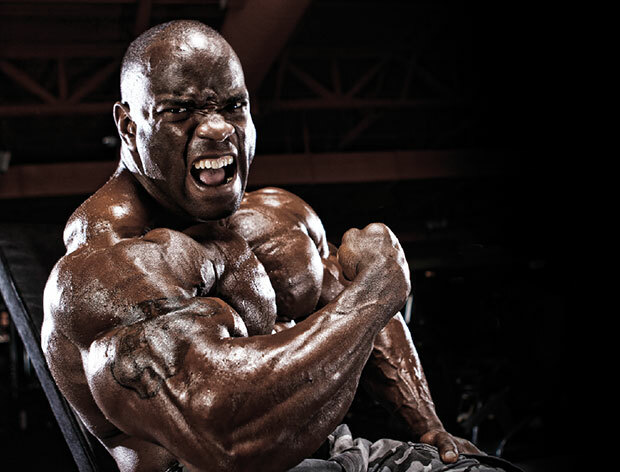 Few IFBB pros can boast the credentials of Johnnie O. Jackson. He is the quintessential odd man out when it comes to any particular bodybuilding lineup because Johnnie isn’t a one-trick pony. He’s a fierce competitor pulled in two different directions by two different passions, as oddly similar as they are opposed. Johnnie O. Jackson is among the power elite of our industry referred to as “power bodybuilder.” That means he’s not only responsible for placing in a staggering 46 bodybuilding shows since 2002, racking up three pro wins, but has also enjoyed a successful powerlifting career, which included the title of World’s Strongest Professional Bodybuilder in 2009 with a 1,338-pound push/pull total over Ben White’s 1,206. In competition, Johnnie has pulled 832 pounds raw, benched 600 in a shirt, and squatted 825 in a suit. The dude not only looks strong, he is strong! Now, Johnnie is looking past his stage career and transitioning to the other side of the stage into show promotion; At the time of this interview, he was putting the finishing touches on his first show, the NPC Johnnie O Jackson Classic, October 24 at the Little Rogers Auditorium in Fort Worth, Texas. With all that going on, this highly underrated legend made the time to answer a few questions. 1 – The NPC Johnnie O Jackson Classic? I see you’re sticking with the NPC … the real one? Absolutely! I didn’t think much of that announcement [referring to a plea for attention from a disgruntled former NPC Texas district chairman]. There will never be competition to the NPC. How many people have tried, even with money? It’s never going to go. Never has, never will. The IFBB/NPC made my career. They helped make me who I am and enabled me to take care of my family. I’m not turning my back on them. The good thing that came of it is that Lee Thompson isn’t presiding over Texas anymore. We have a great chairman now, Ed Pariso. Now we finally will be able to get help from our chairman. 2 – When did show promotion become your future? I don’t know. This is my first year doing a show. Sometimes I think to myself, What did I get myself into? But it’s a great honour. I stayed around long enough, and after competing for all these years, I finally get to put on a show. 3 – Do you think “promoter” is the path your career is looking to take? I hope so. I’m hoping with this show’s success maybe Ed will add a few more. And it will keep growing. I’m promoting now because my competitive days are winding down, but I still want to be involved somehow as a bodybuilder. 4 – The World’s Strongest Professional Bodybuilder is only putting on a bodybuilding event? No powerlifting? This year, we were only set up for bodybuilding. But, next year, I’ll have more time to plan, get a bigger venue, so I can add powerlifting and CrossFit. I’m looking forward to bigger and better things for next year. I’ve already spoken to my sponsor, Mutant, and they are all for it. 5 - So, is 832 pounds your best deadlift? That was at a powerlifting meet? Do you think powerlifting affected your bodybuilding? Yes, it’s the real deal. 832 pounds in competition—raw. It’s pretty heavy. I always loved powerlifting. Bodybuilding too. I really love powerlifting, but it doesn’t get the attention it deserves. I could have done a lot better in bodybuilding if I had just focused on that. But it is what it is. I had fun doing both, and I was able to take care of my family doing it. Never limit yourself; you have to do what you want, the things you feel passionate about. At the end of the day I want to say I did it my way and did all the things I dreamed of doing. Powerlifting separated me from the rest of the pack. It makes me unique. I knew within the first five years of bodybuilding I’d never be Mr. Olympia. I just did the best with what God gave me. I definitely challenged those who were competing with me. Nothing I ever did suffered from a lack of effort. 6 – Your legs were always your weak point shape-wise—not in the squat! If there was ever a complaint about your physique, it was that your legs were kind of straight up and down and didn’t match your upper body. But, this year it really looked like you brought up your legs and added some sweep. The difference is dramatic! What did you do? I think early on I had to prove something. For some reason I thought I had to continuously compete. I dieted and dieted and did eight shows a year for several years. I just kept dieting my legs down and down. Now, I take time off and let them rest. I paid attention to them more. 7 – How often do you train them? What’s your workout? Day 2: Inner and outer thigh – adductor and abductor machines leg extensions, lunges, leg curls; lying and standing – supporting movements – slow, five-count up and five-down, pause up and down, squeeze and concentrate. Day 3: Calves and hams. 8 – But 15th place this year? WTF?! Look, it’s the “Olympia” for me. It’s the honour of competing in that show for my 12th year. Yes, I could have placed ahead of this guy or that guy. But, the way I look at it, if you’re not in the top six, then it doesn’t matter. I don’t get caught up in who I could have placed ahead of. I’m not going to let one show define who I am. I work hard, keep my nose clean and do what I have to do. Wherever I end up is where I end up. 9 – What did you think of the Kai Greene thing? It’s the same as the Lee Thompson deal; I really don’t have an opinion. They’re grown men, and they make their own decisions. Personally, I wouldn’t be dumb enough to do what they did. It’s just foolishness to me. Any of us onstage would be lucky to be in Kai’s position. It’s him not caring about anything except himself and getting a lot of attention over it. 10 – Where do you think men’s bodybuilding is headed? Some people seem to think it’s on a decline. I think it’s just a fact of the mess that’s going on right now. People love negativity, especially the media. I think we just need to get through the storm and let things settle. I think when we’re out the other end, we’ll be a better and stronger organization. We can take a punch. As a promoter, now I can understand—bring it on! Yes, they are bringing on other divisions, and some people think that’s to weed out the bodybuilders. I don’t think so. We need to offer other alternatives to the freak show. I can’t imagine what teenagers say about the freaks they see onstage. How can they achieve that? The newer divisions give them another thing to aspire to. Bodybuilding is certainly impressive in one way—I can understand it—but to a teenager, it’s got to be overwhelming if not off-putting. I think the new divisions will balance out the available competitions, and we will become a better federation for it. BCAAs during workout. These help give an insulin spike to help drive nutrients into muscle and helps recover while you train. Stimulant: pre-contest and contest dieting to burn fat. For more info about Johnnie Jackson, click here!